In 1982 we made a change to the frame that required a change to the lens. We can still provide lenses for any year port. 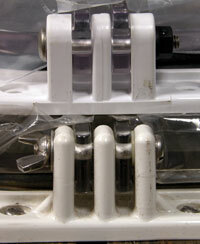 The top lens hinge is manufactured after 1982. The outer posts measure .31 inches and the center post measures .25 inches. 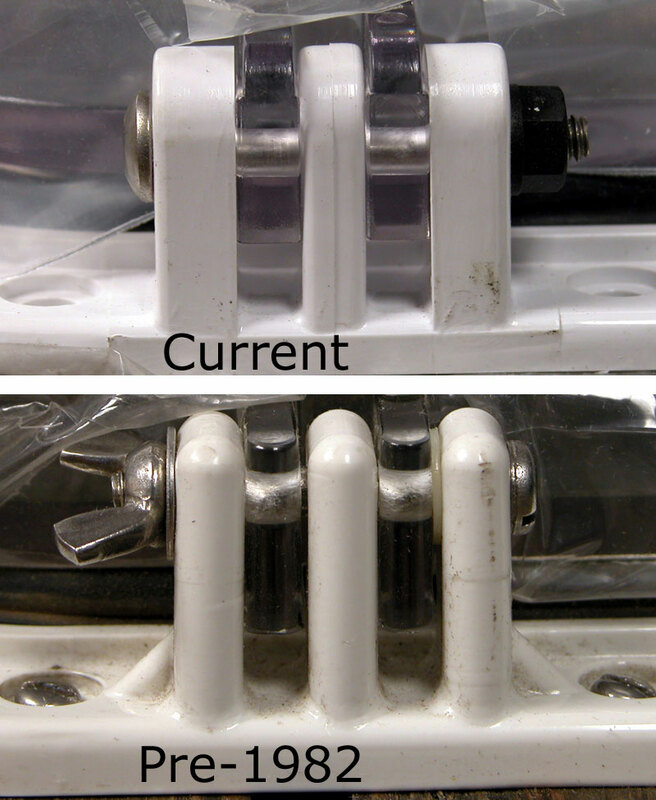 The bottom hinge was manufactured up to 1982. All three posts measure .26 inches. In most pre-82 installations, you may have a wing nut and washers. There may also be webbing to the outside of the hinge at a 45 degree angle. The backup ring is only used if you do not have a screen in the port. We install the backup ring when we ship the ports to the OEM’s to help them install the port. It provides backing for the gasket so the lens seals properly. They should remove the backup ring and install the screen. If you have both in, please discard the backing ring. To order Lens order part number LNZ-*** and specify color. Lens colors are Clear, Smoked (green tint). If the production date of your boat is pre 1982, order the Pre-82 lens. Each lens comes with two bolts and nuts. We hear that often. The gasket you took out of your port is flat like the gasket on the bottom. The one we sent you is round and shaped funny. 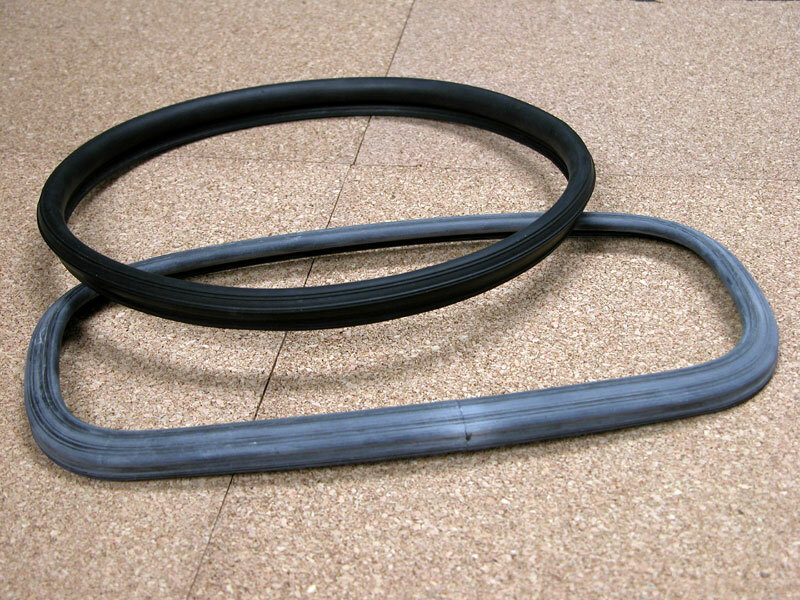 All gaskets start out like this. It's a matter of feeding the leg of the gasket into the groove in the frame. 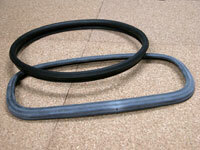 To order Trim Rings for Self Drain ports order part number PTR-*** and specify color. To order Trim Rings for Rain Drain ports order part number PTRD*** and specify color. Trim Rings are available in White, Black. All Beckson trim rings come undrilled. 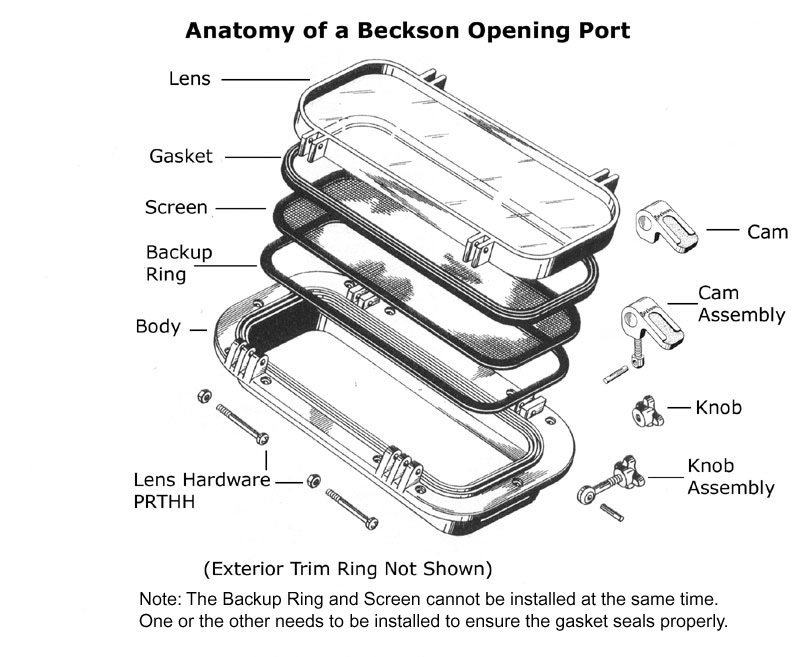 Cam Latches and Knobs for Beckson Opening ports are available with or without stainless hardware. Packed in pairs. See Latches for more information. Cams can be ordered to replace knobs. Detailed instructions come with the cams and can be found at Cam Latch Retrofit information sheet. Frames can be special ordered. The spigots can be cut or extended to the proper depth. Contact us for assistance. © Copyright and Trademarks 2000 - 2018 Beckson Marine, Inc.